Welcome to this year's Ellen Hutson 12 Tags of Christmas with a Feminine Twist series . . . my absolute favorite project/post each year! I'm so honored to have participated in this tradition for the past 7 years, since 2011! (You can find my previous year's tags by clicking (here -->) on the 12 Tags of Christmas category over in my right sidebar). This year we once again have 24 designers paired up for each of the 12 days, to share their talents with you as we provide you with ideas for creating your own tags this holiday season! My partner in crafting today is the very talented Emily Midgett! Please be sure to head over to her blog to see her take on today's theme! We are looking forward to seeing what you are inspired to create from the tags/techniques/themes that are shared this year and we would LOVE to have you participate! Just look for the little “theme box” (below) on each post and use the designer’s tags to inspire you to join in the fun! 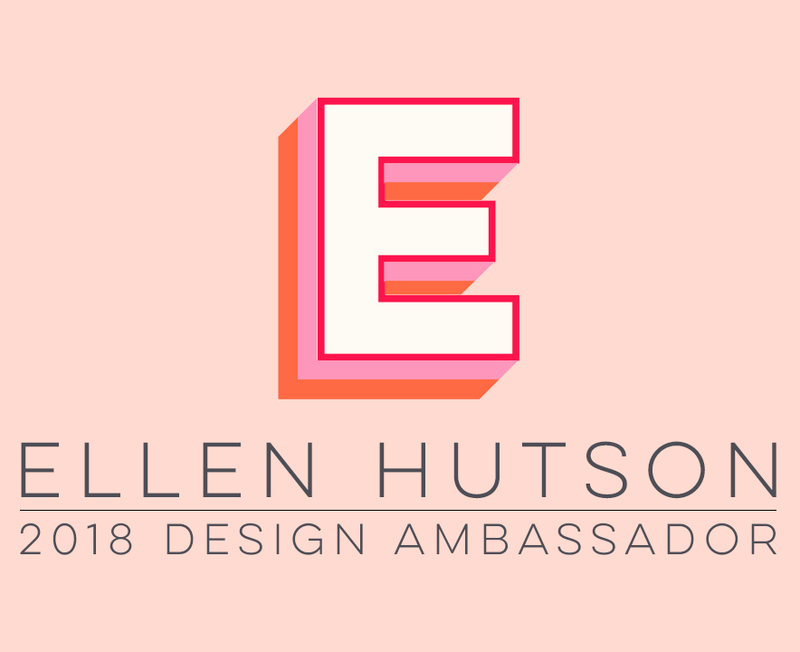 Remember to leave a comment every day sharing your appreciation with the artists (on the Ellen Hutson CLASSroom blog AND the designers’ blogs, too). In doing so, you will automatically be entered into the random drawing for a $25 gift code to the Ellen Hutson shop! Need a little creative encouragement to join in the fun? How about a $150 gift code the Ellen Hutson shop! (Imagine being able to shop for items on your wish list for free)! To participate in our Feminine Twist Tag Challenge, please head over to this Ellen Hutson CLASSroom blog post to find the guidelines to link up your fabulous creation(s)! Now get ready for my tag filled with tons of techniques and one of my very favorite themes: Florals/Botanicals! First, I traced a #8 Manila tag onto #110 Neenah Solar White cardstock and cut it out. That gives you a sparkly snowfall background! #3 - HEAT EMBOSSING: One of my absolute favorite techniques -- probably the first one I ever attempted! I say "attempted" because I bought embossing powder and Versamark ink from the craft store BEFORE I ever really started making cards or scrapbooks, going on the advice that I could use a hair dryer to set the embossing powder! Needless to say, that was an epic fail!! I learned my lesson and invested in a good heat tool! First, I heat embossed this beautiful Season's Greetings sentiment from Concord & 9th's awesome Very Merry stamp set with Wow! Metallic Silver Sparkle embossing powder -- it has a gorgeous tinsel shimmer to it! I used my Misti for perfect placement. For the snowy edges of my tag, I swiped a Versamark pad around the edges, then heat embossed with this cool Hero Arts White Puff embossing powder -- it has a wonderful grainy/puffy texture to it! #5 - DETAIL CUTTING: I won't lie, fussy cutting around this entire image took some time (while watching TV), but for a very special project sometimes I think it's very worth the effort! A good pair of Precision Scissors is a must! #6 - I don't know if you would call it a technique, but I rarely make a card without it: FOAM TAPE! I popped the image up on X-Press It High Tack Double Sided Foam Mounting Tape and adhered it to the background tag. It gives wonderful dimension to any project! #7 - DIMENSION - I applied Glossy Accents to the red berries, then lightly sprinkled on some glitter for a gorgeous sparkly 3-dimensional effect! #8 - SNOW EFFECT - I added Nuvo Crystal Drops in Gloss Simply White on the top of the branch and to some of the greenery, then sprinkled on some glitter, for another neat snowy effect! To finish the tag, I created the hole reinforcer by first coloring Copic R27 onto white cardstock so it would match the other reds in my tag. Then I punched the largest hole from my Crop-A-Dile into the red colored area, then used a 1/2" circle punch around the hole. Finally, tinsel string was tied through the hole. Don't forget to leave a comment below here, and on the Ellen Hutson CLASSroom blog. In doing so, you will automatically be entered into the random drawing for a $25 gift code to the Ellen Hutson shop! To participate in our Feminine Twist Tag Challenge, please head over to this Ellen Hutson CLASSroom blog post for all of the details. It's that time again ... my favorite post and project of the year! Today over in Ellen Hutson's the CLASSroom I'm sharing this holiday tag I made for my chosen theme of The Night Before Christmas for our 12 Tags of Christmas with a Feminine Twist! The twist this year is that you get to see inspiration from a guest designer as well, and joining me today is the incredibly talented Jean Manis! Please be sure to head over to our post on the CLASSroom and leave a comment there for your chance to win a $25 gift certificate to EllenHustonLLC.com! AND if you try your hand at making your own tag with any of the 12 chosen themes, link it up by Dec 16 and you'll be entered to win a $250 shopping spree! (Full details can be found here). Be sure to head over to the CLASSroom to get the full details on how I created my tag AND to see Jean's beautiful version! It's time again for one of my favorite annual projects . . . Ellen's 12 Tags of Christmas with a Feminine Twist! I hope you'll join me today over in the CLASSroom, for all the instructions on how I made this year's tag with one of my favorite Copic techniques I created last year, Double-Embossed Copic Background or Dry Emboss Alcohol Resist! Be sure to leave a comment each day on each tag post over at the CLASSroom, for your chance to win some fabulous products from Ellen's store! 12 Tags of Christmas 2011 with a Feminine Twist! I had a fun afternoon creating my feminine twist to Tim Holtz's 12 Tags of Christmas (day 3)! I hope you'll join me over in Ellen Hutson's the CLASSroom to see how I created my tag. And Ellen is giving away blog candy each of the 12 days -- all you have to do is leave a comment on each day's blog post to be eligible to win!